Freshman year, three friends and I decided to go on a road trip to New Orleans because we didn’t feel like doing the typical college party scene during our week off. We ended up having the trip of a lifetime and became closer than ever because of it. I mean, what better way to get to know someone than to sit in a car for hours on end all while traveling to cool places? Here are three tips to plan a road trip if you are like us and want to do something different for your spring break adventure. Plan a Route. Planning a route is probably the most important thing to can do before deciding to ride off into the sunset with your friends. It gives you the chance to plan stops along the way and figure out accommodations. For us, we made the decision to end in New Orleans, but made a stop in Nashville on the way there and then climbed the Smokey Mountains on our way back! It made the drive seem more bearable and gave us the opportunity to see places other than New Orleans! Bring Snacks. Sitting in the car for hours on end can get a little boring and, let’s be honest, what better way to break time up than to eat? Picking up value-sized bags of chips and fruit from stores like Cost-Co or Sam’s Club before you leave is a great way to ensure you’ll have enough food for the duration of your drive and will end up saving you money by not having to buy snacks at every gas stop! Be sure to also pack waters and drinks, but be careful with this one—too much liquid results in too many bathroom stops. Split Costs Evenly. To ensure optimal road trip success and overall friendship success, it is important to make sure everyone feels they are not being ripped off. Try having every other person fill the gas tank, have every one bring different snacks to munch on, and split accommodations evenly to stay fair during your trip. When we went, we also let our driver off the hook of a few gas fills on the way home—I mean, after all, even though we all took turns driving, it was her car we were putting the miles on! Find a plan that works for your group and stick to it to keep everyone happy and ensure fairness. 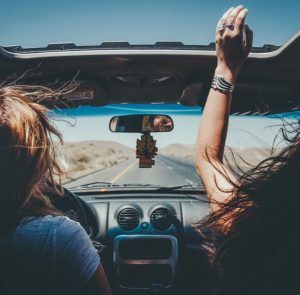 If you choose to go on road trip for spring break, be sure keep these tips in mind to make the most of your adventure. It is truly the most incredible experience, so be sure to take lots of pictures, eat all the food, and make the best memories with your friends because college might be the only time you have an opportunity to road trip across the country!